The food you eat affects your body. 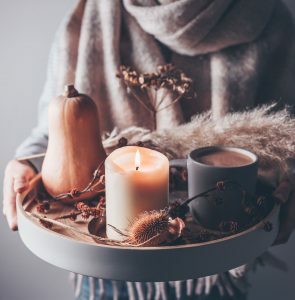 When the temperature drops and cold weather sets in, fuel your body with food that can help raise your body temperature and make you feel warm. Here are some nutritious foods that can help keep you warm in cold weather. In general, foods that take longer to digest can help raise your body temperature and make you feel warmer. The medical term for this process is thermogenesis, which is the process of your body producing heat caused by food metabolizing. Look for food that’s high in healthy fats, proteins and carbohydrates. Many of these foods are more complex and take longer to digest. Bananas have a lot of vitamin B and magnesium, which are important for your thyroid and adrenal glands to function properly. These glands help regulate body temperature. Bananas can also boost your mood and preserve your memory, among other health benefits. Hot ginger tea can make you feel warm inside on a cold day. Ginger is known to be good for digestive health and can stimulate thermogenesis. It’s also a diaphoretic, which means it will help your body warm from the inside out. Keeping you warm is only one of the many health benefits of drinking ginger tea. Start your day with a hot breakfast of oats or other types of porridge. Oats are a great source of whole grains and fiber. Fiber can improve your cholesterol and make you feel full. In addition to keeping you full and warm, oats are full of other nutrients. One of the benefits to drinking coffee is the caffeine. Caffeine increases your metabolism, which can raise your body temperature. Technically, iced coffee can be even better because it has more caffeine. However, if you can’t give up the warm cup of coffee in your hands, you’ll still get the benefits from a hot cup of coffee. Red meat, such as beef, lamb and pork, is a good source of iron. Iron is an important mineral to help carry oxygen throughout your body. People with low iron may notice cold hands and feet or feel tired easily. Eating red meat can also supply vitamin B12, which contributes to healthy nerves and a strong immune system. Sweet potatoes and other root vegetables need more energy to move through the digestion process, which raises your body temperature. High in vitamin A, vitamin C and potassium, sweet potatoes can add fiber and other nutrients to a warm winter meal. Research shows sweet potatoes are also good for eye health. Butternut squash are a nutritious way to warm up on a chilly day. This fall food is packed with antioxidants, vitamins, minerals and other key nutrients. High levels of vitamin C and potassium offer a boost to your immune system and dietary fiber helps keep your digestive system healthy. A simple way to help your body stay warm this winter is to drink water. Water keeps your body functioning at its best and helps regulate your internal temperature. Dehydration causes your core temperature to drop, which may lead to hypothermia. People are less likely to drink water when it’s cold outside because they don’t feel as thirsty, according to Summit Medical Group. You may want to carry a water bottle with you to serve as a reminder. You may follow the old adage that a shot of whisky can keep you warm. However, whisky and other kinds of alcohol actually lower your body’s core temperature. You may feel warm at first but it will be hard to stay warm over time. Alcohol also impairs your ability to shiver, which is a natural response to raise your body temperature. To stay warm this winter, avoid drinking alcohol at tailgates at other outdoor events. At the end of the day, nutrition is about balancing your diet to support your unique health needs. Hy-Vee Pharmacy Solutions (HPS) offers nutrition counseling to help patients manage chronic, complex conditions. HPS patients can work with me, licensed-registered dietitian Megan Hall, to develop a personalized nutrition profile in support of their overall health goals. Regardless of your condition, a balanced diet and good nutrition can help you live easier, happier and healthier every day.